If you came to this page from an outside link, you may want to see the Picture of the Month and visit the main page. "They’re Back!" program commemorating the 21-Jun-1984 return of cable cars after the Great Reconstruction of 1982-1984. June, 2004 Picture of the Month. They're Back! The headline of the San Francisco Examiner informed the world. The date was June 21, 1984. On that date San Francisco held festivities celebrating the return of the city's full three-line cable car system. These began with a ribbon-cutting ceremony at Union Square, followed by a parade of cable cars up Powell Street, led by a U.S. Marine band. 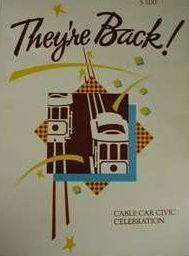 Celebrations had been held earlier that month for the return of the California Street and Powell-Hyde cable cars. In late September 1979, the cable car system was declared so unsafe that all three lines had to be shut down, and service was not fully restored until the next April. Much of the system that was still in place came from the post-earthquake rebuilding of 1907-1910. The repairs were only stop-gap measures. What was required a total rehabilitation of the system, which would include the channels, tracks, and pulleys, and the entire barn and powerhouse. San Francisco had become a city whose economic base was becoming ever more dependent upon tourist dollars, and the unique cable car system of Andrew Smith Hallidie was universally recognized as a major asset in attracting visitors to the city. Recognizing the importance of the cable car system to San Francisco, the entire system was shut down for rebuilding on September 21, 1982. The next day the San Francisco Municipal Railway (Muni) began the Cable Car System Rehabilitation Program. Sixty-nine city blocks of old tracks and cable channels were removed and replaced. The Washington-Mason carbarn and powerhouse was completely rebuilt, except for the chimney (that dates from 1887) and exterior walls, which were retained (and reinforced) so that the building's traditional appearance could be preserved. The ladder track in the car storage area was enclosed, as it had been in the original 1887 barn. Washington-Mason had been largely destroyed in the holocaust of April 1906. During the reconstruction many improvements to the system were made. Curves were banked and their radii increased to enhance passenger safety. The gripman's cry "'cout for the curve" (the often-used version of "look out for the curve") became almost obsolete. New heavier rails became uniform throughout (some of the rail on Powell Street was former horsecar rail from the 1880s). Reinforced-concrete channels for the cables beneath the streets replaced the old channels. New 510-horsepower DC electric cable propulsion motors and gearboxes, a new cable strand-alarm system, and four new turntables were other upgrades. Ten California cars and twenty-six Powell cars were repaired, and Muni craftspeople rebuilt a California car. One California car and one Powell car were declared unfit for service and were later replaced. All cars were repainted, and rewired for 12-volt battery systems. The Powell fleet now sported a maroon, light-blue, and white scheme reminiscent of the colors of the original 1887 Powell Street Railway (No. 3 was kept in green and cream). The emergency brake on the cars was modified, and the trucks and axles on all of the cars were completely rebuilt. When the Powell Street cable cars returned in June 1984 only No. 3 was kept in green and cream the Powell colors from the mid 1940s until 1982. No. 3 is at Powell and Market Streets, March 1985. At that time all the other cars of the Powell fleet sported a maroon, light-blue, and white scheme reminiscent of the colors of the original 1887 Powell Street Railway (Ferries & Cliff House Railway). Walter Rice Photograph. During the 1982-84 shut down, Muni was ever mindful of the importance to San Francisco of the cable car. Cable cars are the symbol of the City. While Washington-Mason was being rebuilt, the Cable Car Museum found temporary quarters in the Embarcadero Center. 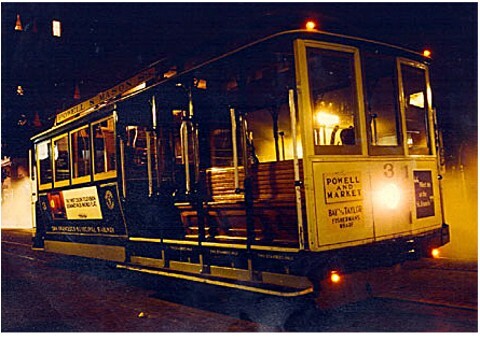 Cable cars were put on display at strategic locations - for example, a California Street cable car was displayed in Justin Herman Plaza and a Powell car on the steps of the Hyatt on Stockton Street. 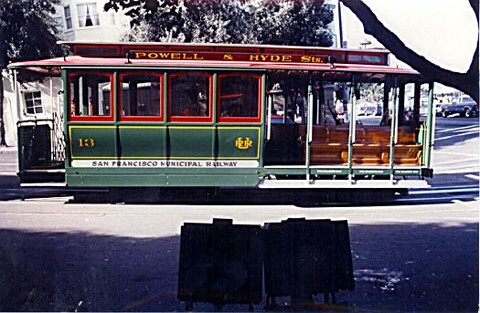 To partially substitute for the temporary loss of cable car service, San Francisco held the first San Francisco Historic Trolley Festival during the summer tourist season of 1983. The festival consisted a fleet of "heritage" streetcars running along the Market Street. Ultimately, the Trolley Festival evolved into today's Muni's highly successfully F-Market & Wharves heritage streetcar line that connects the Castro, Market Street and Fisherman's Wharf. Historically streetcars had displaced many cable car lines in San Francisco and elsewhere. Now the City's remaining cable car lines had created the environment for the return to San Francisco's streets of a fleet of heritage streetcars - a fleet that complements Muni's cable car operations. Importantly, since the cable cars again began to traverse San Francisco's streets Muni has not only continued its upgrade program, but improved upon it. On April 10, 1990 the rebuilding of Powell Street Cable Car No. 16 was celebrated with a parade on Powell Street and ceremony and entertainment. Car No. 16 is painted in the blue-and-yellow scheme Muni used between 1939 and 1946. Three Powell cars had this scheme for a brief time after Muni acquired the Powell lines in 1944. No. 16 was the last car that when it became too worn for rehabilitation was to rebuild so that it was almost entirely new. (In some cases, that meant keeping not much more than the roof of the original car.) After that the railway started the current practice of replacing an old car with a brand-new one. On December 5, 1992 Muni introduced to the public three brand new cars - Powell cars Nos. 13 and 21 and California car No. 49. No. 13 is painted in a green with red-trim paint scheme similar to the colors of the United Railroads. The United Railroads had operated the Powell Street cable car system from 1902 until 1921. No. 49 was the first new California Street cable car in approximately seventy-five years. Muni built cable car No. 13 that entered service on December 5, 1992 is at Hyde and Beach Streets awaiting its turn to use the turntable to make another trip to Market Street on the Powell-Hyde cable line, October 1994. No. 13 is painted in a green with red-trim paint scheme similar to the colors of the United Railroads, the operator of the Powell Street cable car system from 1902 until 1921. Walter Rice Photo. On September 15, 1994 new Powell car No. 4 was placed into revenue service after a public welcoming ceremony at the Powell and Market turntable. The second brand-new California Street cable car No. 52 entered revenue service on February 2, 1996, after a brief ceremony at the Washington-Mason cable car barn. The third new Muni built California car No. 59 entered revenue service on July 31, 1998 as part of the celebration of the 125th Anniversary of Andrew Hallidie's successful operation of the cable car. Brand new Muni built California Street cable car No. 59 is completing its first trip, July 31, 1998. The location is the non-revenue trackage on Hyde Street at Sacramento. The trackage on Hyde Street between California and Jackson is used for California Street cable car to go to and from the Washington-Mason car barn. Bruce Battles photo. Two years later on April 24, 2000 new Powell Street cable car No. 9 entered revenue service painted in a green and white paint scheme similar to the colors of the Market Street Railway, the operator of the Powell Street cable cars 1921 - 1944. During the week of February 16, 2003 new California Street cable car No. 60 began its journeys up and down Nob Hill. Lastly, new Powell Street cable car No. 28 debuted on January 2, 2004 replacing first No. 28, a Mahoney Bros. product dating from 1887. Each of these new cars is made of wood, glass, brass, and steel and takes about 18 months with a cost of approximately $400,000 (2003) to build. They are a tribute to the skills of the Muni craftspeople. Although most of the construction practices are the same as the original car builders', Muni craftspeople have made some improvements, such as in the finish of the wood and the fit of the joints on the cars. Given the care that is taken in building the cars, it is easy to see why the cars have been called of the finest cable cars ever built. This car building program is in addition to routine maintenance, painting and partial reconstruction of the fleet. These cable car upgrades are not the only upgrades that have been made to the system during the twenty years since the cable cars returned. On June 25, 2001 a new turntable was placed into service at Powell-Hyde line turnaround at "Friedel Klussmann Memorial Turnaround," Hyde and Beach Streets. 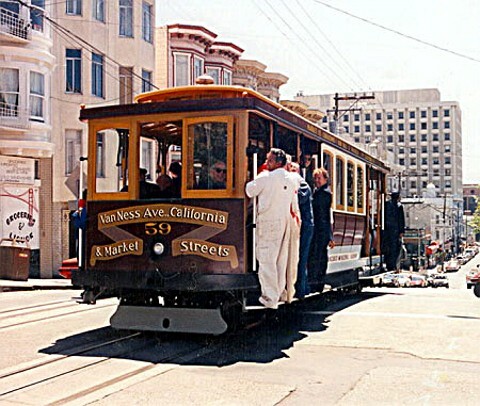 On October 28, 2002 Powell Street cable car service began a period of being out of service, allowing the Muni to perform long-term preventative maintenance work, and the installation of a new turntable at Powell and Market Streets - the location of the world's most famous turntable. The new $500,000 turntable has extra ball bearings to make it turn more easily. Also, support and depression beams were tightened to keep the cable taut beneath Powell Street. Similar work was done on Hyde Street during its shutdown. As part of the ongoing improvement to the California and Powell Street cable car lines, the traffic signal system for the California line at California Street and Grant Avenue was rebuilt during April 2004. During May 2004 the California line was shut down for major upgrading of the line involving its mechanical components. Base schedules have been lengthened from every six minutes to every eight minutes on both the Powell-Mason and Powell-Hyde lines, reducing the combined Powell Street service from three to four minute headways. This was done to improve schedule reliability, realistically reflecting traffic conditions encountered by the Powell Street cars. During this two decade period a variety of celebrations have been held honoring cable car events - notably, the annual Cable Car Bell Ringing Contest between cable car crew members. San Franciscans and visitors alike look forward to the annual contests, which are traditionally held on the third Thursday of July at Union Square. Events have been held honoring Andrew Smith Hallidie, the inventor of the cable car and Friedel Klussmann, the savior of the Powell Street lines. Specially decorated cable cars have appeared on the streets. For example, during the Christmas holiday season 2003 eight cable cars were adorned with seasonal decorations. The employees of the Cable Car Division have annually hosted a Christmas luncheon for San Francisco seniors. Everybody who loves the cable cars owes a large debt of gratitude to the men and women who designed and built and operate today's cable car system, and to all of those who help provide the service to the public. But we must always remember that today's cable car system would not be possible without the "reactionaries" and "meddlers" who, under the leadership of Friedel Klussmann, had the foresight to realize that "progress" can mean keeping and improving something that might seem "old-fashioned," and not just scrapping it for something that might seem "modern" and new. An anniversary commemoration is a time to consider what we can do to make it better. Suggestions include possibly resurrecting the California-Hyde proposal, whereby a new cable line would be created from California and Market Streets to Hyde and Beach Streets using double-ended California cars. Another alternative would to extend the California line from Van Ness Avenue west to Fillmore Street, which has become an entertainment zone. Future track reconstruction could consider sound deadening. The Cable Car Museum could be refreshed with new exhibits and adopt a policy of exhibit rotation plus develop an archival center to truly represent San Francisco’s city symbol. Fortunately for cable car lovers and the city's economic base, San Francisco realizes that the cable cars have benefits far beyond their sentimental value. The little hill-climbing cars are the symbol of the San Francisco. Continual upgrades and recognition of the cable car system will ensure that this invaluable asset will be part of San Francisco for future generations. 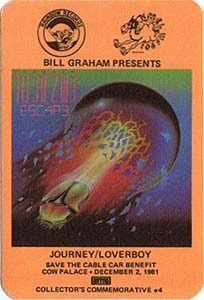 A Bill Graham Presents promotional pass for an 02-Dec-1981 appearance by Journey at San Francisco's Cow Palace at a Save the Cable Cars benefit. Loverboy was scheduled as the opening act, but cancelled at the last minute. I wasn't a fan of Journey, but they did a nice thing for the cable car reconstruction project. "San Francisco: cable cars are here to stay," Tramways & Urban Transit (The Journal of the Light Rail Transit Association), October 2004, Vol. 67, No. 802. Some materials used in the article were directly drawn from Of Cables and Grips, coauthored by Robert Callwell and Walter Rice, published 2000. Copyright 2004 by Val Lupiz and Walter Rice, PhD. All rights reserved.